Hi, new to the site. We are planning a charity raft trip from Stratford to Gloucester. Can anybody give us a guide to cruising time between the two please? Have a look at https://canalplan.org.uk. You can see the details on there and experiment with timings. Have you been in touch with CRT to get ermission to carry out your event? If they agree to allow it, they will be able to advise on any conditions that will apply. Have you been in touch with CRT to get permission to carry out your event? If they agree to allow it, they will be able to advise on any conditions that will apply. CRT are the navigation authority for the River Severn from Tewkesbury to Gloucester. You will also need to contact the Avon Navigation Trust if you plan to raft down their river from Stratford on Avon. I don't know how you're powering your raft, but at canal boat speeds it's about 2 easy days from Stratford to Tewkesbury and then half a day down the Severn to Gloucester. On my boat I'd plan for 3 days assuming neither river is in flood. Thanks blackrose that’s exactly what we wanted to know. With regard to permission, we were just going to get insurance and a bsc and license it just like any other craft. If it's an open raft, is there anything to check re. boat safety? It will be open, however it will have some sort of motor, fuel system and electrical system. Although we could probably get away without one, we hope to find a examiner that will appreciate the charitable cause and maybe donate or reduce his costs. This way all paperwork is in place and all should go smoothly. Are you powered by engine, oars or just current?? If the latter 2, you need to make sure you know where weirs are in relation to the locks as you will have to be on your toes, even if the rivers are in a benign state......and obviously add a lot more time to the above timings! Do you plan to use a petrol outboard? If so, where do you intend to store the fuel? Most likely will be an outboard with remote tank. Preferably tucked away somewhere, or secured on deck if it makes any sort of difference to the bsc? If the raft is propelled by an outboard motor, and has no electrical system, then you don't need a bsc. See the chart linked under "Boat Safety Exemptions" at https://canalrivertrust.org.uk/enjoy-the-waterways/boating/buy-your-boat-licence/choosing-and-buying-your-licence. I don't think this stops you from having things like hand held battery powered torches on board. For a one off, one way, few day, charity event? Seems odd. Surely a charity event on the waters of 2 other charities could come up with a better arrangement than something that will have costs seriously eating into the amount raised for whatever your good cause is? Incidentally, you haven't mentioned your charity. What is it? I cannot imagine anyone in their right mind going from the upper Parting down to Gloucester lock on a raft without a great deal of preparation, CRT approval and a safety boat or two. In fact I would be quite surprised if Tewkesbury Upper Lode lockie will let an unannounced raft in to the lock, let alone out again. The potential reputational risk to both navigation authorities is high and they (having real money) are prime lawyer targets in the event that something goes awry on their patch. It may be that the OP has already contacted both ANT and CRT to sort out their requirements and get approvals, registration or licence waivers etc., but the post does not read as if that is the case. Lots of planning needed IMHO. I agree, talking to both ANT and CRT about the exact plans is essential. The Avon has unprotected weirs, and the approach to Gloucester can get exciting when the rever river is flowing a bit, and it does that in spades even in summer. Ok looks like there’s a few points I should clarify here. first of all I have probably confused some people by calling it a raft. This won’t be something we knock up on a morning out of some barrels and rope. It will be more like a pontoon boat. Built in a workshop over the coming months, by a group of friends including welders, fabricators, carpenters and engineers. And will be built with the safety certificate requirements in mind, It will be as seaworthy as any other craft. Although we don’t want it to necessarily first appear that way, in an effort to get people talking about it and hopefully raise more money. The reason we are thinking of going down the safety certificate route is partly to simplify everything planning wise and also to give us all the correct paperwork (bsc, license and insurance) to prove all is ligitimate to anybond along the way. Another reason being we plan to use it for other fundraising events in the future, a bsc simplifying that also. Cost wise we are confident we will find an examiner willing to reduce his costs in the charitable cause. We have already had a great deal of donations of materials from various suppliers, even the promise of a engine from a chandlers! Charity wise the trip will be in memory of a close friend of ours who passed away recently. This follows on from the collections at his funeral and the charities he chose were the air ambulance and cancer research. I hope this puts a few people’s minds at ease, and you see this isn’t just a laugh and a serious trip that we are putting a great deal of planning in to. Ok﻿ looks like﻿ there’s a few points I should﻿ clarify here. Thanks for that, I feel sure you'll get more advice and support now. Good luck with your quest! river festival when over 70 narrow boats moor on the River and 1000s of locals turn out for the weekends events in the adjacent park. 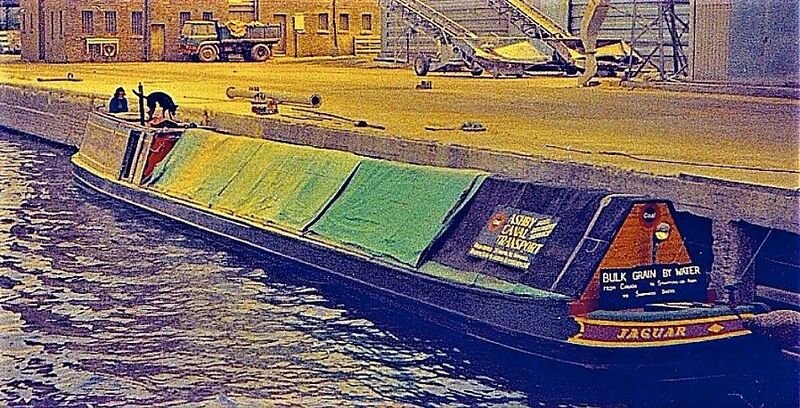 We attended in June 1975, we had struggled up the Avon with a load of grain from Sharpness Docks, making 'Jaguar' the first loaded boat for 100 years. 'Tadworth' had an easier time bringing coal down the canal. Somehow it's hard to imagine how 1975 could be so long ago. Mind, that photo makes it a bit easier! Interesting snippet Chris, and a fair few indelible memories no doubt. That is a very good point. The river festival would provide a great fun raising opportunity, you could contact Strat>Forwarding see if you could book the raft in and if they would allow charity collections. Indeed. Mostly memories of David Hutchins' Land Rover pulling us through silted up lock exits. We started out with only 14 tons on, but gave up at Barton. JCB to raise the weir, Dragline to dredge channel, and tractor and trailer to remove about 7 tons. Didn't do the bottoms a lot of good. When I asked the guy at Sharpness for 14 tons, he said "You mean 14 hundred?" "No, just 14 please". Still made clouds of dust.